In a small bowl, whisk together the reserved marinade and the Dijon; it’s OK if it doesn’t emulsify. 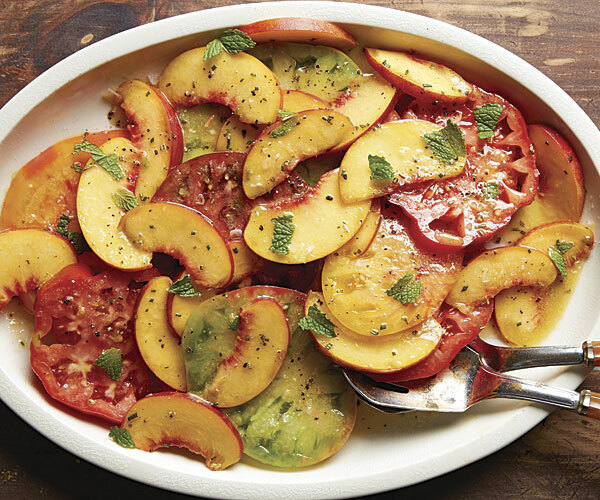 Arrange the tomato slices on 4 plates or a platter, top with the peaches, and drizzle some of the vinaigrette over the top. Season lightly with salt and pepper and garnish with the mint. Pass any remaining vinaigrette at the table. Serves 4. This savory marinade balances peaches’ natural sweetness with the complex tartness of sherry vinegar. Fresh rosemary adds earthy pine notes, olive oil lends richness, and rum contributes a bit of spice. The marinade also softens the skins, which means you can skip the tedious task of blanching and peeling the peaches. These peaches are delicious in salsas, salads, topping flatbreads and pizzas, and in braises. Gently combine all of the ingredients in a medium bowl and let marinate at room temperature for at least 20 minutes and up to 24 hours. After marinating, you can refrigerate the peaches for up to 1 day. This entry was posted in Salads, Seasonal Gardening, Sides and tagged mint, peaches, rosemary, sherry vinegar, tomatoes. Bookmark the permalink.